A group of young people from the Foster Carers Association worked with the staff to knit two lovely blankets which they then donated to our project. 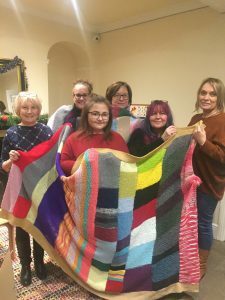 The FCA Midlands team set up a knitting club for its young people and since then, staff have worked with foster children on a number of projects – most recently on two blankets, which the young people asked to be donated to a local charity. It was apparent a lot of time and work had gone into producing these lovely blankets and we were very pleased to receive them.